The sheer mettle of nettles. They are taking over the garden: cropping up in the vegetable patch, dominating the borders and creating no-go zones in the middle of the lawn. But revenge comes in many forms – all of them tasty. 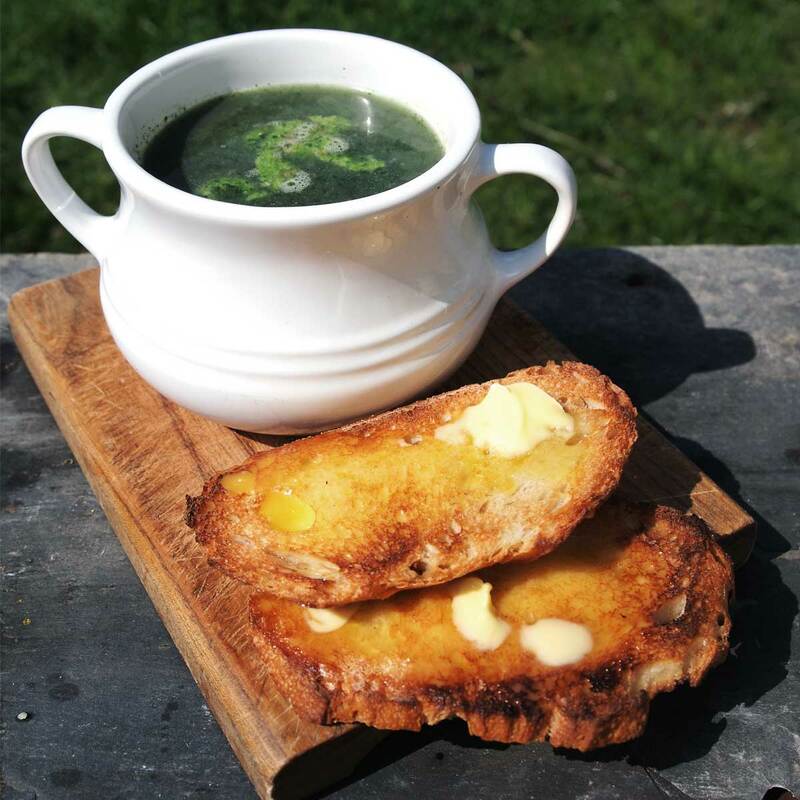 Nettle soup is a well-worn classic: virtuous and brilliantly evocative of Spring but hardly exciting and there are a thousand and one recipes for it washing around the Internet. In short, it needed re-mastering. This is a soup with substance; a filling bowlful of hearty satisfaction. Pepped up with the warmth of some aromatic spices it is perfect for those evenings when the sun dips a little too fast leaving the seven o’clock air with a surprising, biting chill. I’m fairly certain you know how to make a soup so forgive me if I patronise. Fry off your chosen spices in a little oil until they in turn start to release their oils. The smell will change, just take care not to burn them else you will add a bitter note to the soup. Crush them in a pestle and mortar then add the garlic. Fry the onion until soft then add the potato (both sweet and regular). Give it a little colour then add the spices and garlic before covering with stock. Leave to simmer until the potatoes are cooked then blend and pass through a sieve to remove and rogue crunchy spices. Wash and pick over the nettles removing any thick stems and inevitable creepy crawlies. Cook in plenty of rapidly boiling, salted water then leave them to drain in a colander or sieve. 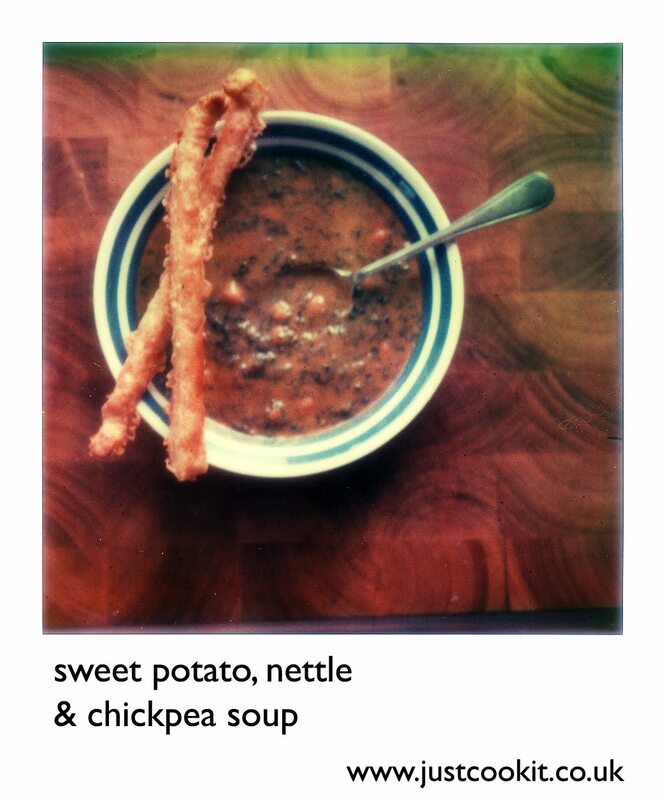 Chop the nettles then add to the soup along with a can of drained chickpeas. Heat through and serve with bread or cheese straws anda big jumper. As an accompaniment to Indian food, aloo saag (potatoes and spinach) is a firm favourite. 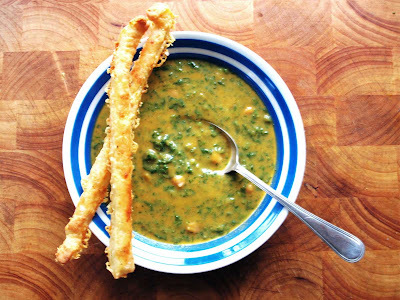 Here the spinach is replaced with blanched and chopped nettles which gives a wonderfully fresh, almost grassy flavour. It works. Fry the spices in oil, lower the heat then add the onion and cook until it softens. Add the garlic then the potatoes. Cook until they begin to colour and are soft throughout then add the chopped nettles. Let down with a little water if necessary, season and serve with whichever curries you desire. Love the phrase "sheer mettle of nettles"! Excellent! On the subject of foraging, have you done anything with dandelions? This is perfect comfort food. I could totally picture myself chowing down on the nettle soup while reading a book near the fire. I'll wait for a cold day for this one!! Thanks for sharing! Ah! I LOVE The Nettle Aloo idea. I will have to try that next week. Wow nettle aloo sounds gorgeous, must try it! I like your generosity with the butter on the toast! Nicely done! And the nettle aloo sounds superb. Love the bit 'serve with bread or cheese straws and a big jumper'! !